Counting redcoats: Who were the imperial soldiers serving in New Zealand in the 1860s? 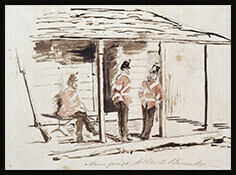 In this episode, Charlotte Macdonald and Rebecca Lenihan will discuss the development of a database of men serving in the imperial regiments in New Zealand, the nature of the ‘big data’ generated by the War Office, issues, limitations and possibilities to date, and goals for the database’s continuing development, along with some preliminary analysis. An initial release of the database is planned ahead of Rā Maumahara – the National Day of Commemoration on 28 October. At least 12,000 imperial soldiers served in New Zealand in the wars of the 1860s. Who were the faces behind the uniforms serving Queen and government in this pivotal moment in New Zealand’s history? Where did the soldiers come from? Where did they go to? Many men had served in the Crimea, India or Australia. Some women and children also travelled with the regiments. What did they bring to New Zealand? And how might the wars on these soils be understood within the broader history of the British Empire in the mid-nineteenth century? Professor Macdonald is Professor of History at Victoria University of Wellington Te Whare Wānanga o te Ūpoko o Te Ika a Maui. Dr Lenihan is a post-doctoral fellow at Victoria University of Wellington Te Whare Wānanga o te Ūpoko o Te Ika a Maui, working with Charlotte Macdonald on the Soldiers of Empire project. She is the author of From Alba to Aotearoa: Profiling New Zealand’s Scots 1840-1920 (Otago University Press, 2015). Recorded at the National Library of New Zealand, 4 October 2017.